The pushup is a great beginner exercise or something to help your warm up, but when it comes to gaining mass it just doesn’t cut it. When you are on the road with no equipment, or are playing a drinking game they’re just fine but if you’re being serious with your routine they aren’t enough. The truth is, most people don’t feel that they are getting a lot out of doing traditional pushups, and they would be right. This is because most of us have been doing them since we were kids, everyone to some extent. This is even more true if you exercise regularly. When your body does the same exercise or work over time it adapts in an effort to do this work more efficiently. This is an evolutionary trait animals developed to save energy and is important to understand in developing your workout routine. Pushups themselves aren’t the problem, it is the way you’re doing them! Because your body is doing new variations of the pushup, it has to utilize different muscles that it hasn’t before and is not used to performing the work. This means that in order to do so your body is going to have to adequately adjust or adapt, resulting in massive gains in a shorter period of time. Yes, the key here to gain as much mass as possible in a short period of time is variation. Keep your body confused by switching up your routine to progressively get bigger. One of the biggest issues with the pushup is that it has a very limited range of motion. Think about it, your starting and finishing positions are with your chest on the floor or slightly touching it. Imagine if you could get more of a stretch in the chest forward, like you would in a fly. One way you could increase the range of motion is by elevating yourself. You can do this by performing the exercise on a table lift, or using kettle bells. 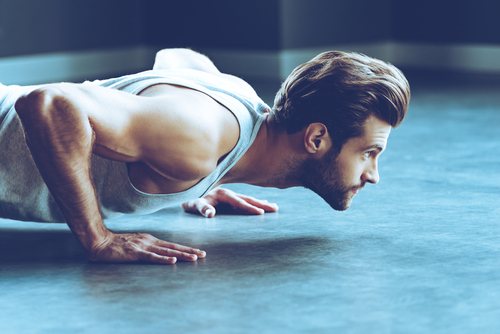 Elevated pushups give you a wider range of motion, and you will definitely feel it the next day. 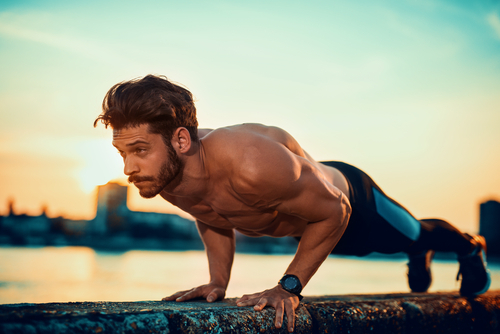 Drop pushups are similar to elevated pushups in that you start in an elevated position, but you do not stay in the elevated position and thus do not get the extra benefit of increased range of motion. The reason why we want to do drop pushups is because they are not only going to stress our muscles, but our skeletal system as well. This is because we are starting in an elevated position, and dropping down to the floor, and back up again to finish the repetition. To do this, get a riser or two for your to start on, and place them slightly further than shoulder length apart(you need enough room in between them to fit when you drop down). Place your hands on the elevated lifts, push yourself up, move your hands to the floor, do the pushup and pop back up on the lifts to complete one repetition. Your feet should be placed on the floor close together like you would in a normal pushup, and should not change position throughout the entire exercise. 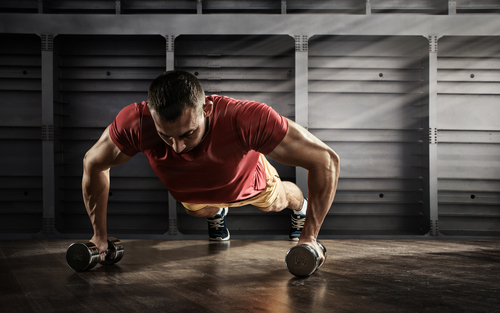 If you really want to push yourself, try a combination of pushup exercises to work yourself the hardest. One challenging variation is called a close grip offset. Having a close grip, to where your hands make a triangle allows for more variation by putting more stress on the triceps, giving you a nice difference. In addition, you perform this pushup by going from one elevation to the next. It is best done by using a kettlebell where you can prop yourself up on it using the triangle pushups alternating as well. Start with the right hand on the floor, left hand on the kettlebell, and do one rep. Alternate to two hands on the kettlebell, then do another with the left hand on the floor and right hand on the kettlebell.